An electronic billboard off Interstate 93 in Medford was part of a state pilot program and posed no safety hazard. Drivers along Massachusetts highways could soon be seeing new, eye-catching scenery: electronic billboards. The new state-approved regulations authorizing the billboards go into effect Dec. 7. They follow a three-year pilot program that tested the digital signs in selected areas and showed that electronic billboards created no safety hazards for motorists, said Sara Lavoie, a spokeswoman for the state Department of Transportation. While opponents fear a proliferation of garish and distracting displays, Lavoie said that the department is following about 40 other states in embracing the technology, and that the signs have been “very beneficial” for promoting public service announcements. The billboards will also promote commercial products and services. The regulations bar the use of flashing lights or moving video in the display. Permits for electronic billboards that stand alone, not at the site of businesses they advertise, will be subject to approval from affected communities as well as the state. While the application fee for a new permit will be $1,000, “we’re not looking at this as a revenue generator in any way,” Lavoie said. Stephen Ross, president of the Boston division of Clear Channel Outdoor, the largest owner of billboard panels in the state, welcomed the new regulations, saying the rules will help the state economy. But not everyone is on board. Somerville Mayor Joseph Curtatone said that he has been working for 18 months to hammer out a deal with Clear Channel to reduce the number of billboards in Somerville by moving them out of neighborhoods and placing some on main thoroughfares such as the Interstate 93 corridor. Former governor Michael Dukakis, a longtime critic of billboards, spoke out against the proposed rule changes during a public hearing on the matter in June. He noted that he and his wife, Kitty, live part-time in Los Angeles, which he said is flooded with electronic signs. Dukakis could not be reached for comment Tuesday. Five companies, including Clear Channel, joined the pilot program in 2009 that allowed electronic signs to go up in Chicopee, Foxborough, Medford, Stoneham, Lawrence, Fall River, and New Bedford, Lavoie said. Mayor William A. Flanagan of Fall River said Tuesday that having one of the signs along Interstate 195 has helped the city, and that he would support additional billboards. He said his city’s electronic sign has helped local businesses seeking a “cost-effective” way to advertise, and the city has also used it put out public service announcements and promote local festivals. He said the city does not get a percentage of the advertising revenue but does collect property taxes on the billboard. Chicopee Mayor Michael Bissonnette said safety concerns are allayed with electronic billboards that display static images and do not change rapidly. Apart from the pilot state program, some organizations have placed electronic displays on their premises, including WGBH studios in Brighton. It has what it calls a 30-foot-by-45-foot “digital mural” on the side of its building facing the highway that is “designed to brighten the ride for commuters” with one thought-provoking image each day, according to its website. Lavoie said the state does not track the number of “on-site” electronic signs in the state, because those permissions are granted by local communities. 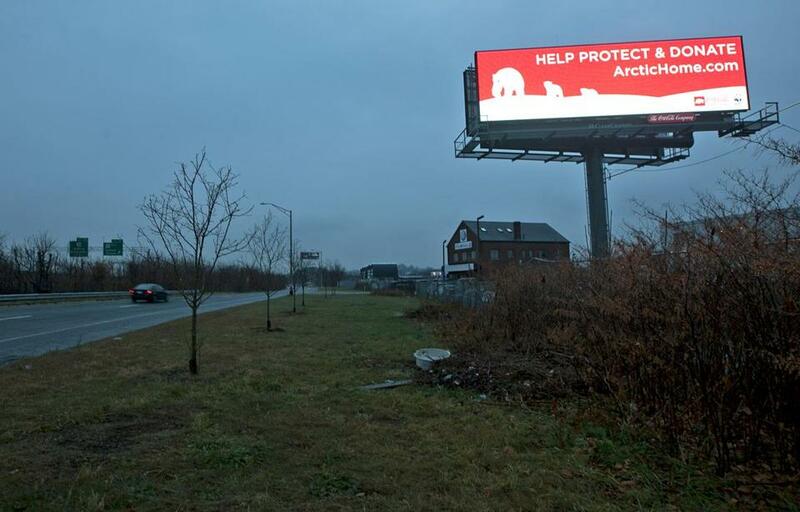 “Our new electric billboard regulations focus on off-premise, stand alone advertising,” Lavoie said, adding that new permits could be issued for thoroughfares such as Interstate 93 and the Massachusetts Turnpike, provided that affected communities approve. According to a copy of the new regulations posted on the website of the state Office of Outdoor Advertising, a wing of the Transportation Department’s Highway Division, displays on electronic signs must remain static for at least 10 seconds. In addition to flashing lights and videos, audio is also banned under the new regulations. The electronic billboards will be required to display public service announcements for at least 15 hours every month. There is no set cap on the number of permits that can be granted, Lavoie said. The Transportation Department has not decided when it will begin accepting applications. Richard Davey, the secretary of the transportation department, did not have to formally sign off on the rule changes, according to Lavoie. She said he was not available for comment on Tuesday.